Who does the baby really look like? Daniel - It’s too cute to be the one on the right. Katie Simari - awww, i guess it is too early to know if the baby is a boy or a girl. but he or she looks comfy. it is good that you follow dr.’s orders. You’re a good mommy. oh! and ummm… E.T.??? hahaha, silly. Allaina Stewart - I’ll be keeping your family and the baby in my prayers : ) It’s better to be careful, at least you don’t have to do housework! I’m glad you can still work, I don’t know what we’d do without you! Kenny Roy - Totally looks like a motorcycle helmet w/ googles! Daissy - lol, I’m sure no one wants a baby with long glowing fingers. But seriously, listen to the recommendations and take much care. After spending some time with you in Boston I can only understand how important is work and family for you. You know we are here to help anytime. Hugs! Aunt Deb - I will be praying for you guys – previa usually does resolve over time (remember your Aunt Deb is an OB nurse). 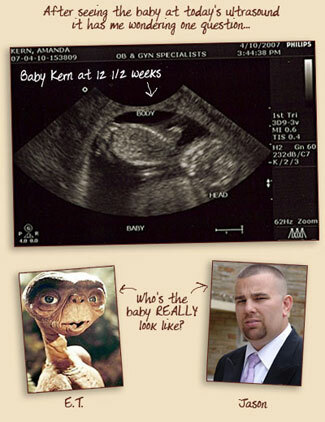 I always like ET so having his baby in the family might be fun! !